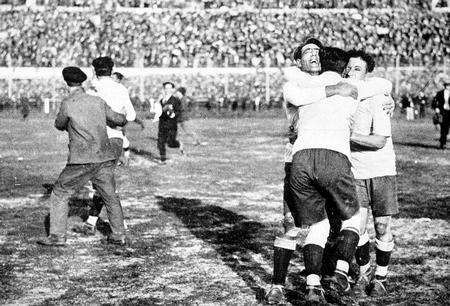 On July 30, 1930 exactly eighty five years ago today the first World Cup was captured by Uruguay after they defeated their fierce rivals Argentina by a score of 4-2 in the Final. Before the advent of the World Cup the official champions of world football was determined by the Olympic tournament. Under FIFA President Jules Rimet, football's governing body were encouraged by the popularity of international football in the Olympics and sought to create an independent tournament of their own. When an international football World Cup was proposed, Italy, Sweden, the Netherlands, Spain, Hungary and Uruguay all stepped forward as potential hosts, but eventually all of these nations dropped out with the exception of Uruguay. As the 1924 and 1928 Olympic champions Uruguay were the dominant footballing force of the era and from a football perspective were an attractive host, but the cost and difficulty of travelling to South America in 1930 caused many of the European nations to pull out of the tournament. Uruguay had even offered to pay the travel costs of several European nations, including that of England who were not even members of FIFA at that time, but with less than two months to go before the tournament not a single country from Europe had agreed to participate. 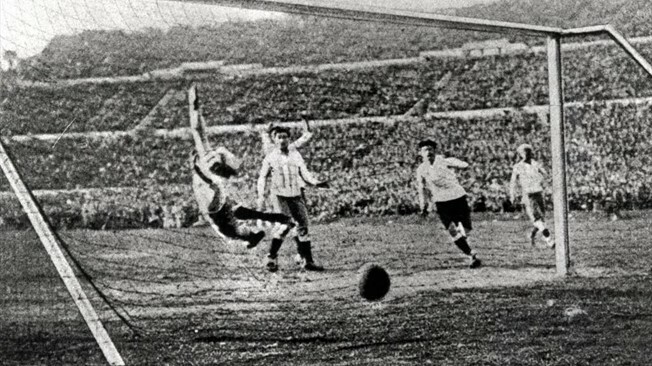 With the competition threatening to not get off the ground, Rimet convinced Belgium, France, Romania, and Yugoslavia to make the trip overseas and with that the first World Cup kicked off on July 13, 1930. The hosts did not disappoint as they cruised through to the final, winning both of their group matches easily before thumping Yugoslavia 6-1 in the Semi-Final. At the Estadio Centenario in Montevideo, in front of 68,346 supporters, Uruguay opened the scoring after twelve minutes with a goal by Pablo Dorado. However, Argentina took a shock 2-1 lead into the half with goals through Carlos Peucelle and Guillermo Stábile. An interesting note about the final is that a strong mistrust between the two sides had caused them to use an Argentinian ball in the first half and a Uruguayan one in the second. Perhaps the ball made a difference, as the second half was all Uruguay as Pedro Cea, Santos Iriarte and Héctor Castro all found the net to cap a 4-2 win and thus capture the first World Cup for La Celeste. The following day was declared a national holiday in Uruguay as fans took to the streets to celebrate the historic victory. Meanwhile in Argentina, irate supporters threw rocks at the Uruguayan embassy. It wouldn't be the last contentious meeting between these two football powers.